We performed a multicenter study to evaluate outcomes, efficacy, and safety of ERCP in patients with cirrhosis. We felt this study was important since little is known about the risk of ERCP in patients with cirrhosis and there is a paucity of literature available regarding this topic. A total of 538 ERCP procedures were performed on 328 patients with cirrhosis. Two-hundred twenty-nine patients had Child Pugh Class A, 229 had Child Pugh Class B, and 80 had Child Pugh Class C. There was a higher incidence of adverse events in patients with Child B and C disease when compared to those with Child A disease (11.4%, 11.3% and 6.1% respectively, P=.048). There was no correlation between the risk of significant hemorrhage and the presence of coagulopathy or CP Class, even in those that underwent a sphincterotomy. The presence of poorly controlled encephalopathy correlated with a higher overall complication rate (P=.003). 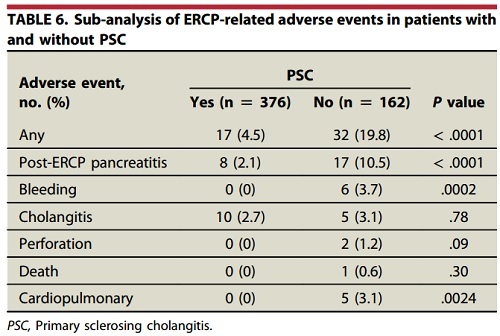 Patients who had cirrhosis due to non-PSC causes had a significantly higher overall rate of adverse events, pancreatitis, bleeding and cardio-pulmonary complications after ERCP when compared to those with PSC.